Shopping for gifts can be challenging. I wonder if some mulled wine can help the process? 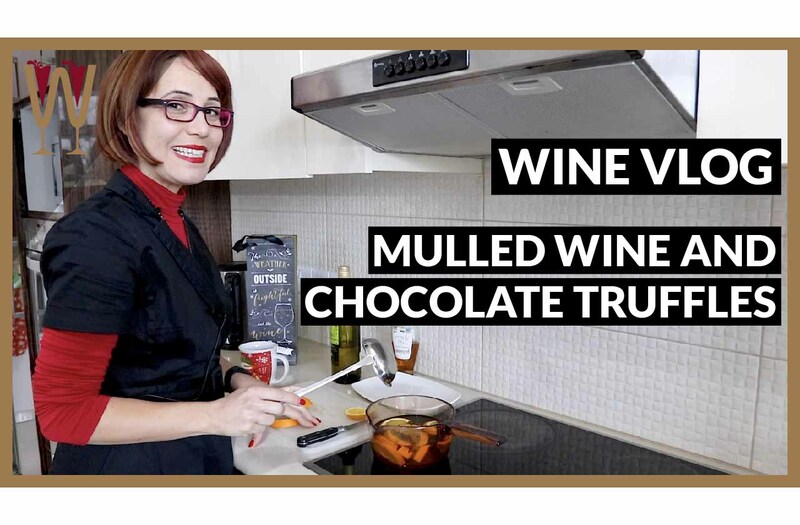 A white wine is used in the mulled wine recipe in this video, as the mulled wine is created before your very eyes! Also, dessert wine and chocolate truffles. And the making of the chocolate truffles. Enjoy the WineScribble Christmas Video for 2018! Ugh, I can’t find anything. I’m getting desperate. Hey Tasters! There is a Christmas tree covered in gifts behind me, which seems a little bit ironic because I’ve been walking around Larnaca Center looking for presents for my loved ones, and so far I have failed completely. I need a plan B.
It’s not just the Christmas gifts that challenge me this time of year. I always cook the Christmas lunch for my family and even though I love every minute of it. It can be difficult getting the timings right. Because there are so many dishes cooking at the same time. Luckily over the years I have built a tradition with a good friend. We get together a week before the big day, and we help each other build a foolproof timetable. Of course this is usually accompanied by a bottle of big, spicy red wine. However this year I’ve decided to mix it up a bit. I remember that many years ago when I was spending Christmas in the UK, I was introduced to the idea of mulled wine. I hated it. Spices and oranges floating about, and the whole thing warmed up. Why would anyone do this to wine? And I haven’t tried mulled wine since. But, the other day I came across a recipe for mulled wine that uses white wine. I’m curious to see if the milder flavour of white wine will be more forgiving. So let’s make some Christmas mulled wine. Here is my list of ingredients. Inexpensive white wine, check. Cinnamon sticks, check. Cloves, check, check, check. Honey I’m sure there’s a special place in Dante’s seventh circle of hell for adding honey to wine. Oh, and orange slices. I’m on it right now. This needs to simmer for 15 minutes. I can’t watch this anymore let’s see what this tastes like. Okay, this is awful! Mulled wine is much worse than I remember. Why would anyone do this to wine? I can’t give this to my friend. She’ll never let me forget it. Hang on, sweet white wine, redolent with aromas of citrus and baking spices. Why didn’t I think of this earlier? La Terra. I have this wine already. This is a desert wine from the island of Limnos. Made with organically grown late harvest Muscat of Alexandria. Absolutely awash with the aromas of Christmas. Orange marmalade and cinnamon and cloves. You know what? I’m feeling inspired. I think I’m going to whip up some chocolate truffles, scented with this divine dessert wine. All you need is extra dark chocolate, a splash of cream, and a splash of your favourite dessert wine. So this is now firm it just needs to cool down a bit so I can form it into truffles. And that’s why I’m going to pop it in the fridge for 15 minutes to speed things up. This more than makes up for my mulled wine failure. So just take the mixture and roll it. When you’re done with it, roll it either into cocoa powder, which is classic. Or, if you want to mix it up a bit, you can also roll it into pistachio nuts or almonds. And I’m gonna do all three because why not. This is a really, really messy job. It’s kind of mesmerising just watching them roll around. Delicious, chocolatey with a splash of my favourite dessert wine. These taste amazing! This is a Christmas win. Christmas is a feast in the middle of winter that’s meant to remind people that spring, the season of plenty, is just around the corner. Christmas was not about consuming but about sharing. Everyone contributed to the feast and this is how plenty was achieved in the middle of food scarcity. It’s all too easy to get distracted with the directive of spend, spend, spend. And just consume mindlessly. However Christmas was originally about sharing. Not individual consumption. This is the time to connect with family and friends, reaffirm bonds, and slow down. This is why as long as there have been human societies, at this time of winter festivities, people have always shared wine. Divine dessert wine, gorgeous chocolate nibbles, and my pens and my paper. We are ready to devise a Christmas action plan. Guys if you’ve enjoyed this video, give it a thumbs up, share it with a friend. Open the description below, I’ve left you a little bit more information about this dessert wine, because it’s perfect for Christmas. If you haven’t already, please subscribe. Tasters, enjoy your Christmas holidays. Make them all about sharing and I’ll see you on the next video. Cheers everybody!